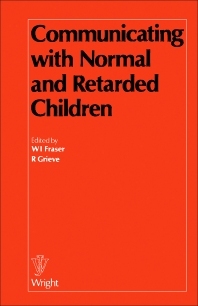 Communicating with Normal and Retarded Children explores the way in which normal children acquire language and the mistakes they make. It aims to trace the common growth between professions in understanding of normal language development and the retarded person's language and to encourage research, particularly of an interdisciplinary kind. This book is organized into five main sections. The contributors provide different professional perspectives of how and why the mentally retarded get their communication wrong and what remedies can be applied. They also present their own research findings, often in little-explored areas or from a novel angle, and offer their opinion on the types and topics of research that should be carried out. This book will be of interest to academic and clinical psychologists, educators, linguists, advisors and tutors in nursing and social studies, child health doctors, psychiatrists, and a range of therapists.